Click a button below to learn more information about a specific category of memorabilia. One of the most popular areas of Indy 500 collecting are programs. It is believed there is a program for every event* held at the Speedway (excluding special events such as the 1971 Sesquicentennial Celebration, match races, economy runs, test sessions etc.) from the very first balloon race held in June of 1909 through today. The following pages will cover IMS official programs, reprint and bootleg programs from 1909 through the present day. Another popular and colorful area of Indy 500 collecting are tickets. It is believed there is a ticket for every event* held at the Speedway (excluding, match races, economy runs, test sessions etc.) from the very first balloon race held in June of 1909 through today. The following pages will cover IMS tickets from 1909 through the present day. The following pages will cover the the four main and miscellaneous publishers of yearbooks about the Indianapolis 500 since 1946. 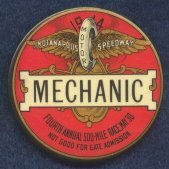 Metal pit badges have been issued by the Indianapolis Motor Speedway every year since 1938. The following pages will cover badges, back up cards and fake and reproduction badges. Since the Speedways opening in 1909, credentials have been issued by the Indianapolis Motor Speedway. The following pages will cover the different types of credentials issued by IMS from 1909-1946. Since the balloon race of June 1909 through 1957 and later on in various years since then, panoramic photos have been produced. The following page will cover the various photographers, and the different types and sizes produced. The following page will cover Hulman/George gifts from 1946-1949 and glassware gifts beginning in 1950. Another popular area of Indianapolis 500 Memorabilia collecting are the Wilbur Shaw aluminum toy race cars which were reproductions of Shaw's 1939 & 1940 winning Maserati. The following page will cover the different varieties of Wilbur Shaw cars.